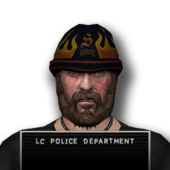 Simon Nashly is a criminal in Liberty City who is wanted by the police for racketeering. His model is that of a generic Angels of Death biker. Simon Nashly's name is very similar to that of Rockstar games designer Simon Lashley. It is possible that this is an easter egg that was added into the game. This page was last modified on 26 February 2014, at 03:30.